All Students and Parents/Guardian must attend this meeting or meet with Mr. Dugdale in regards to show choir costs and expectations! Rehearsal sessions will take place in the Vocal Music room at Millard North High School. Students need to attend as many rehearsal sessions as necessary to learn the audition material. Attendance will not be taken. On Wednesday, April 29 students will be taught 16 counts “on the spot” to see how quickly they pick up choreography. This will be considered part of their audition and will help the directors place students in an ensemble that best suits their abilities. Beginning at 8:30 AM and continuing until all have been heard. An actual schedule will be determined after the rehearsal sessions. We will try to accommodate as many special requests as possible. The entire audition time frame is from 8:30 AM—6:00 PM. Auditions are CLOSED to spectators and will take place in the Multi-purpose room at Millard North High School. Any Middle North High School student is eligible to audition. 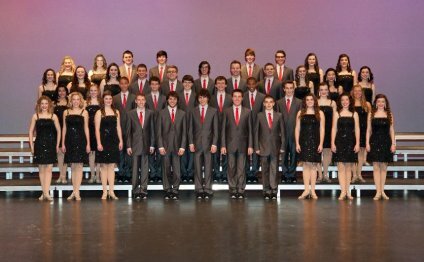 Those students selected for a show choir must also be enrolled in Voce Choir, Cantori Choir or Singers Choir next year. Spaces are filled on the basis of vocal talent and movement/performance skills. 1.) Singing “My Country ‘Tis of Thee” without accompaniment in the key of your choice. 2.) Singing and dancing the required song (Beautiful Day) taught by the Senior show choir members. 3.) Returning a signed permission form prior to the audition. Students will audition in pairs, but must perform “My Country ‘Tis of Thee” alone. There will be a panel of three judges for the auditions and their decision will be final. This choreography was posted with the permission of Ms. Melanie Walters, choreographer. It is used for the audition purposes for Millard North High School ONLY.